In order to qualify a member of the household must earn at least $3000.00 annually in farmwork and meet income guidelines. Reino Del Cielo does not have direct subsidy but offers affordable rents for low income households through the Washington State Housing Tax Credit Program. We also accept Housing Authority provided Section 8 vouchers. WSHFC Tax Credit income limits apply. Please call for details, eligibility and availability of units we will be glad to help you. The 51-unit property includes two-, three- and four-bedroom homes, with rents up to 54 percent below market. The community includes a set aside of 75 percent of homes for farm workers earning 50 percent or less of the area median income. Located in Grant County, Reino del Cielo was developed by Catholic Charities Housing Services in 2009. The project consists of 51 units of rental housing for Farm worker households. The development serves low income Farm workers at or below 50% of the AMI. Reino del Cielo is a newly constructed community of affordable homes for farm worker families in Royal City, Wash. Located in a small farming town with a long-growing season and a wide variety of crops, the community is built on a site once occupied by a vacant and deteriorated housing development. 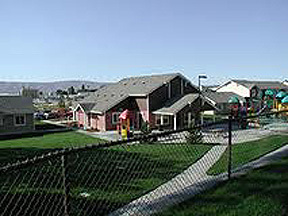 Amenities include a community center, computer room, front and back yards, play structures and social services geared towards serving a majority Latino resident population. The community is within walking distance to downtown and bus transportation in this small town of just over 2,100 residents. Yakima, the nearest city, is 80 miles away. Washington State Tax Credit limits. Eleven percent of the units serve families with incomes below WSHFC 30% of the area median income (AMI), 75% serve families at 40% of AMI and 14% serve families with incomes at 50% of AMI. In order to qualify a member of the household must earn at least $3000.00 annually in farmwork and meet income guidelines. Reino Del Cielo does not have direct subsidy but offers affordable rents for low income households through the Washington State Housing Tax Credit Program. We also accept Housing Authority provided Section 8 vouchers. WSHFC Tax Credit income limits apply. Please call for details, eligibility and availability of units we are here to serve you.